A TV journalist covering the battle to retake Mosul from occupying ISIS fighters was killed by a roadside bomb Saturday, Rudaw TV said. 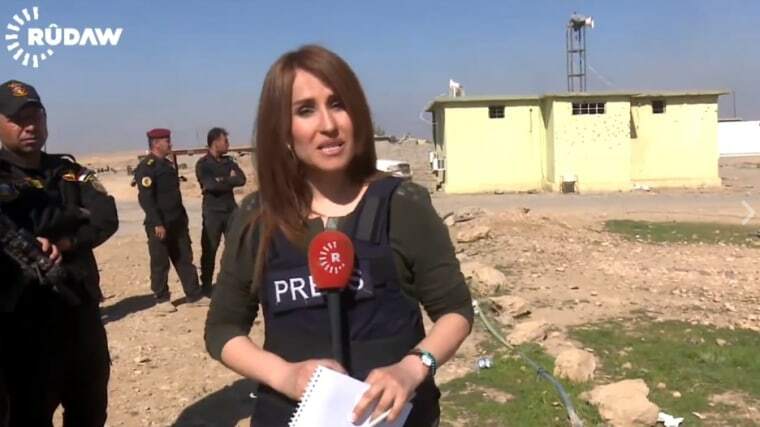 Shifa Gardi, 30, was killed and her cameraman was injured, the Kurdish media organization said in a statement. It's the first recorded killing of a journalist in Iraq in 2017, the Committee to Protect Journalists said; at least six were killed in the country last year. "Shifa Gardi was one of Rudaw's most daring journalists," Rudaw Media Network said. "She was known as a renowned skilled journalist in Kurdish news media, and brought outstanding coverage to Rudaw TV right from the beginning of its establishment." Gardi's death comes amid an offensive by Iraqi forces to recapture the western section of Mosul from the terror group ISIS, which seized the northern Iraqi city in 2014. In November, Iraqi forces entered the city for the first time since it was seized, and on Feb. 19 Iraqi forces launched an offensive to drive ISIS from the western section of the city. Rudaw Executive Director Ako Mohamm told colleagues that Gardi "was an example of dedication." "We were always urging them to be behind the frontlines of the war, telling them that they were not soldiers or Peshmerga fighters,” Ako said, according to Rudaw. "It appears that Shifa had moved closer to the frontlines out of seriousness to her job," Ako said according to the network. "We are saddened by the passing of Shifa. Her place will remain irreplaceable in Rudaw, but she will always stay in our hearts." The United Nations Assistance Mission for Iraq was among those who expressed condolences to Gardi’s family and friends Saturday. The agency called her a "young, caring professional." U.S. Ambassador to Iraq Douglas Silliman also expressed his deep condolences. Brett McGurk, U.S. presidential envoy for the coalition to counter ISIS, said on Twitter: "She was everything ISIS fears: a journalist exposing their lies." BBC Middle East correspondent Quentin Sommerville called her intrepid and determined. "Shifa Gardi's tragic death underscores the continuing risk that journalists in Iraq face while doing their jobs," Robert Mahoney, deputy executive director of the Committee to Protect Journalists. "Journalists covering Iraq, and particularly those covering the ongoing conflict between the Iraqi government and the Islamic State group, have shown remarkable bravery and commitment to their work, and all sides in the conflict should honor that commitment by ensuring that they can do their jobs safely," he said. Iraq’s government said Thursday that its forces retook Mosul airport, which had been used as an ISIS training camp and car bomb factory, according to state TV. Iraqi forces pushed father into the western section Saturday, Reuters reported. About 1,000 civilians walked across the frontlines, the largest movement since the new offensive was launched, the news agency said. Some 750,000 civilians had been estimated to be in the western part of the city when last week’s offensive began, according to the United Nations. Mosul had been called ISIS’ capital in Iraq, although its stronghold is in the Syrian city of Raqqa.